Emirates ! EK ! UAE ! Re: Emirates ! EK ! UAE ! DUBAI (Zawya Dow Jones)--Dubai-based Emirates Airline Wednesday said some of its double-decker Airbus A380 planes for delivery in 2010 will be delayed and that it may take over aircraft orders from rival carriers as it starts to emerge from the effects of the financial crisis. EK a par ailleurs indiqué être intéressé par d'autres A380... C.f. lien d'Artway en allemand. Emirates President Tim Clark elaborated on the A380 delays mentioned Wednesday by Chairman Ahmed bin Saeed Al Maktoum, telling the DPA news agency that three aircraft scheduled to arrive in November and December now will be delivered in December and January. At the end of 2010 EK will operate 15 A380s instead of the planned 20 and it expects to take 11-12 aircraft in both 2012 and 2013. Delivery of its order for 58 should be finished by 2017. Clark also said EK is evaluating converting options on additional planes in order to take advantage of newly open delivery positions and that its Dubai-Incheon A380 service will begin Dec. 14. Cadences finalement conformes aux espérences ? Ouverture de créneaux au délà des 200 premiers appareils livrés ? Emirates Airline president Tim Clark has expressed strong concern over the increasing power of airline alliances, and insists that membership would stem the Dubai-based carrier's development. Addressing the European Aviation Club in Brussels on 12 November, Clark highlighted the drive towards consolidation and suggested that the issue of airline competition risked becoming a "forgotten story" of the economic recession. "Our fear is that aviation's economic recovery in the coming years will see a handful of dominant alliances able to fundamentally alter the competitive landscape in many markets for consumers and unaligned airlines," he says. "Emirates is big enough now to look after itself but we strongly believe protecting the interests of consumers requires governments and regulators to resist opportunistic and self-interested calls from some in our industry to bend fair competitive norms and structures. "It is a difficult operating environment for all airlines but certain approvals for consolidation or the granting of immunities for alliances - which otherwise would be viewed with significant scepticism - must be challenged." He underscores Emirates' resistance to alliance membership, saying that this would become an "artificial brake" on the carrier's business plans, and views 'white spots' lacking alliance coverage as "important drivers for competition and consumer choice". While consolidation can be justified in some cases, and the failure of financially-unviable carriers is necessary, Clark says that the combination, when taken alongside alliance power, "concerns Emirates". Clark is particularly irked about the influence of Star Alliance. He cites examples where authorities in Canada and Germany appear to have acted to defend Star carriers against Emirates - and ridicules suggestions that such competition could damage the alliance. "Hurt Star Alliance?" he says. "How do you hurt a 25-member mega-alliance? And where is the consumer's voice in such a statement?" While the three major alliances have already established a firm presence, and are succeeding in gaining anti-trust immunity, Clark fears that powerful airline groups will continue to cite exceptional circumstances in order to seek "dispensation to dominate more markets". He insists that competition regulators must ensure that a "balance is struck" between consolidation, the clean-out of unviable carriers, and "creation of 21st century monopolies". Crainte que les alliances puissent altérer les règles de la concurrence et biaiser les règles de l'offre et de la demande. Pour EK, Tim Clark justifie son indépendance par rapport à ces alliances, en expliquant qu'une adhésion serait un frein au développement d'EK. Tim Clark vise en particulier Star Alliance qui bénéficierait de la clémence des autorités, notamment au canada (se rappeler de l'épisode qui a conduit les A380 dEK à Toronto) et l'allemagne. Dubai-based Emirates Airline on Monday said it is talking with Boeing and Airbus about orders for "tens" of new aircraft, according to a Dow Jones report. "We're having discussions with Boeing and Airbus," Emirates Airline Chairman Sheikh Ahmed bin Saeed Al Maktoum told reporters at a round-table event on the sidelines of the Dubai Airshow, Dow Jones said. "Not only for firming up options but also for buying more." Ahmed said there won't be any announcements at the Dubai Airshow, but airline President Tim Clark told Zawya Dow Jones that "it wouldn't be too long." In the story, Ahmed said Emirates may be interested in a larger version of the 787 Dreamliner if Boeing were to offer it. Emirates is looking at placing an order for more Airbus A380s and other aircraft as the airline is reevaluating its fleet plans in the wake of the economic downturn and a changed schedule for the new Dubai International Airport. President Tim Clark told AviationWeek that Emirates could use an additional 20 A380s on top of its existing order for 58 aircraft. Whether it goes ahead with its plans will depend greatly on whether Dubai International Airport can accommodate the additional aircraft at the existing facilities, and at the new Terminal 4, which is currently under construction. One important reason behind the considerations is the delayed construction of Dubai's new al-Makhtoum International Airport in Djebel Ali. Although the first stage of the new site will be opened by next summer, Clark says it will take eight years for the facility to have been sufficiently expanded for Emirates' needs. But major construction work has been pushed back by Dubai's government because funding has proved difficult as a result of the global financial crisis. Dubai as a whole has pulled back significantly on many of its prestige projects such as two more artificial palm islands off its coasts and a new world's tallest building, Al-Burj. If Emirates wants to expand further, it will have to use larger aircraft because DXB's two-runway system has limited capacity. "The reason why we initially ordered 58 A380s was because we could not fit any more into the existing infrastructure," says Clark. "We are now talking to the airport about how to accommodate more." A new supplementary fleet plan is also evaluating if Emirates could pick up delivery slots freed up by other airlines. The airline would likely look at more Boeing 777-300ERs. Its existing order for 70 A350s might be changed, too. Today, the airline has signed up for 50 A350-900s and 20 A350-1000s, "but we might invert that" to increase capacity. Emirates is also looking at a letter of intent signed last year for 30 Airbus A330-300s and A350s. It was supposed to have been converted into a firm order by the end of 2008, but Emirates did not go ahead due to the economic uncertainty. But Clark said Airbus has reassured the airline that the deal is still in place from its point of view. Clark indicates that the A330s could end up being too small given the slot constraints at its home base. Separately, Emirates may delay the phase out of aircraft that it was planned to start in mid-2010. Between 2010 and 2013, the airline wanted to get rid of its 29 A330-200s, all remaining 777-200s and 777-300s, as well as its A340-300s. That process could now start several months later in order to provide interim capacity. Clark says Emirates would sell the 10 A340-500s it has because they have turned uneconomical with the high fuel prices, but there are no buyers. The carrier is no longer considering an order for the Boeing 747-8 Intercontinental because it believes that before long the A380 can do the missions from Dubai to the U.S. West Coast. Emirates currently has 53 A380s on firm order in addition to 70 A350s and 23 Boeing 777-300ERs. EK forcé de revoir sa stratégie compte tenu du décalage dans le temps du futur aéroport. A ce titre, la LOI pourtant sur les A330 et A350 datant de 2008 pourrait être confirmée avec modification. A lire aussi le détail du plan de renouvellement de la flotte à court terme et notamment le couplet sur les A340-500 peu économiques mais impossibles à replacer ailleurs. On en parle quand de l'A380-900 ? avec un mois d'avance sur le planning initialement prévu. Details have emerged of Emirates' Airbus A380 delivery schedule over the next three years, which reveal that the airline has pushed back fleet expansion and will not receive any of the superjumbos for almost a year after the end of 2010. Speaking at the Dubai air show, Jim Moravecek, outgoing president of the 50/50 General Electric/Pratt & Whitney joint venture Engine Alliance, said that Emirates, which is the lead GP7200-powered A380 customer, had delayed deliveries: "Emirates will take 15 A380s through next year, then defer for a little while." An Engine Alliance chart showing fleet growth of the GP7200-powered A380 between the first delivery in 2008 and 2012 reveals that from mid-2010, when the Emirates fleet was due to reach 15 units, there are no deliveries for around 10 months. Since the chart was produced, Emirates has revealed that due to production hold-ups its A380 fleet will not reach 15 units until late 2010. According to the chart, Emirates shipments then resume from around mid-2011 (a date that is also likely have moved to the right), with its fleet rapidly doubling over around 18 months to 30 aircraft by the end of 2012. Emirates Airline president Tim Clark recently told Flight International the airline's A380 schedule beyond the first 15 deliveries "remains fluid". In response to the Engine Alliance data, Emirates says "we still have no firm delivery schedule from Airbus", but will not comment about whether it has deferred any aircraft. Emirates has taken five A380s since its first arrived in July 2008. Its sixth, which is due before the end of November, is one of the ex-Airbus development airframes. Nine more deliveries are due through to late 2010. Moravecek, who took over as Alliance president in mid-2008, is returning to P&W early to lead its advanced next-generation product family arm. He has been replaced by Mary Ellen Jones, who will see out the remainder of the three-year term. Meanwhile, Emirates has brought forward the introduction of the A380 on the Dubai-Paris route, with plans to start services before the end of the year. It says the decision is due to an "operational review, coupled with demand on the route" as well as "earlier aircraft availability". Info recoupant bien les infos de plans de charge de l'EA ! à la fin du mois et quatre autres en 2010, a ajouté la compagnie. DUBAI, U.A.E. 24th December 2009 : Marking the first commercial A380 into the Kingdom, Emirates will serve Jeddah four times weekly with the super-jumbo from February 1st, 2010. Jeddah will be the eighth destination to be added to the growing list of gateways served by the A380 which include; Sydney, Auckland, Heathrow, Bangkok, Toronto, Seoul and from 29th December, Paris. The A380 service to Jeddah will be the first aircraft into the city to contain three-configuration cabins. The A380 aircraft will feature 14 Private Suites in First Class, 76 new generation, fully flat seats in Business Class and 427 seats in the Economy cabin. Starting 1st February next year, EK 803 will leave Dubai four days a week on Monday, Tuesday, Saturday and Sunday, at 1630hrs and arrive in Jeddah at 1830hrs. From Jeddah, EK 804 departs at 2045hrs, arriving in Dubai at 0015hrs. Emirates currently has seven A380 aircraft in its fleet. The airline boasts the world’s largest order of Airbus A380s with a further 51 double-deckers still to be delivered. Emirates commenced services to Jeddah in 1989, with Jeddah the first of three gateways that Emirates now operates to in the Kingdom, in addition to Riyadh and Dammam. Emirates currently operates a daily flight to Jeddah from Dubai. EK met en ligne sa version "moyen courrier" (c'est à dire sans espace de repos pour les pilotes) de 517 places en 3 classes sur un vol traversant la péninsule arabique : Jeddah - Dubai, soit moins de 1000 Nm. Application intéressante de l'avions sur du court courrier... (1000 Nm c'est court non ?) démontrant que la grande capacité de la machine lui donne une grosse souplesse. Emirates prévoit de remettre l'A380 sur Dubaï-NY fin octobre et envisage de le mettre aussi sur d'autres villes américaines. (50 -900s/20 -1000s) and 80 A380s. out 68 older widebodies – A330-200s, A340-300/500s and 777 “Classics”. negotiating a big Boeing deal for Farnborough. again about the -300ER replacement”. Merci Art - Way ! Ce serait difficile, voire imprudent que Emirates devienne 100 % Airbus ... donc ils donnent une chance à Boeing, (Et GE ?) normal ! SUH étant hors ILFC, il fallait bien que qq'un reprenne l'aiguillon pour pour remuer un peu les constructeurs, avec SouthWest, et Ryanair pour pousser les MC ! 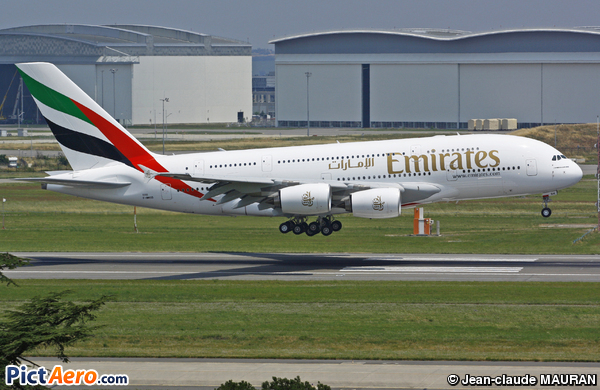 Late last week, Emirates eleventh A380 (MSN030) was delivered to the airline at a ceremony in Toulouse. This now makes Emirates the largest operator of the A380 with eleven SuperJumbo’s in its fleet, while Singapore Airlines has ten, Qantas has six, Air France has three and Lufthansa has one. Je poste un article un peu ancien (un mois maxi) mais très intéressant sur la présence d'Emirates en France et à Nice en particulier. - présence à Nice avec un vol quotidien direct sur Dubai et une demande qui suit l'offre tant en passagers (76%) qu'en cargo (90%). - cargo= 20% de la rentabilité d'un vol. - nombreuses correspondances assurées avec le succès de l'Australie au départ de la côte d'azur. - bonnes prévisions pour l'été sur CDG et Nice (90%). - des perspectives sur Lyon. - pas de crainte de la concurrence de Qatar Airways "ça nous stimulera". On sait maintenant qu'Emirates n'ouvrira pas tout de suite la ligne sur Lyon, qui lui a pourtant été attribué, par solidarité avec Etihad qui n'a pas eu les créneaux demandés et par mécontentement pour ne pas avoir eu plus de vols sur CDG. En tout cas le trafic est là et on sera bien obligé de leur accorder des fréquences dans le futur, n'en déplaise à AF. Au passage on note de nouvelles possibilités de développements pour les aéroports de province avec des lignes inter-continentales. Noté 2 points qui me tiennent à coeur ! - L'effet HUB de Dubaî et le relais "Fret" pour l'extrême Orient ! - Qui n'a pas envie de se détendre les jambes dans un aéroport confortable et pratique avec des free shops qui ne se foutent pas du monde (Je l'espère du moins, à CDG le HT, c'est plus cher que le TTC au super-marché).... et couper ainsi son voyage ... si la correspondance est sous 2 heures, ce qui est le cas souvent avec EK ! C'est sûr que Dubai doit être un hub efficace. Un autre point qui me tient à coeur: on peut éviter AF et CDG et gagner du temps sur l'Asie (1 h environ): pour aller au duty-free à Dubai 1heure de plus!! Attention pour les majors européennes vers les marchés en croissance. Emirates a atteint ses limites et ne s'en cache pas ! C'est clair ... plus d'ordres à attendre pour l'instant ! Ce qui vient, ben faire voler et organiser tout cela ! Organiser DBX et gagner des routes ... et sortir de qq contraintes physiques ! Ce sera l'urgence des prochaines années ! Confirming the much-speculated deal for 30 more Boeing 777s worth $9.1 billion, Emirates has warned that its appetite for further new aircraft orders depends on long-term infrastructure constraints being overcome. The Farnborough order takes the airline's firm 777-300ER commitments to 71 aircraft, and comes on top of a contract agreed with Airbus last month to increase its A380 orders by 32 aircraft to 90. These aircraft will be used for growth and to replace the 68 older A330/A340 and 777 Classics that the airline is to start phasing out next year. Delivery of the newly ordered -300ERs will be interspersed with the remaining 18 777s on backlog, with deliveries due to begin in September next year. However, Emirates Airline boss Tim Clark says that the new A380/777 orders, combined with the airline's existing 777 commitments and 70 A350-900/1000s, effectively brings the current fleet expansion and replacement plan to a close. "Physical constraints are the single largest inhibitors to Emirates' growth - these include what airports can take the A380, how quickly the Dubai hub can be built to match our expansion, and airspace management issues," says Clark. "If it hadn't been for those inhibitors we would have made much larger orders for expansion over the next 10 years." Clark says that an immediate benefit of Emirates' huge June A380 deal has prompted "around 20 airports to contact us and say 'ah, we now realise you are absolutely serious about what you are doing, we'll make our airfields compliant. Will you come here?' Some of these are in the UK and some in continental Europe - so in some respects that part of the jigsaw is being sorted out." connectivity across its entire fleet. SwiftBroadband-equipped A380s with OnAir's wi-fi solution in early 2011.
such as laptops, smartphones and mobile telephones. expected entry-into-service of June 2012.
laptops equipped with GPRS modems. currently supported by Inmarsat's "Classic" and Swift64 services. entry-into-service of connectivity on the carrier's ultra-widebodies. require," says OnAir chief executive Ian Dawkins. Ils font vraiment tout bien chez Emirates, GSM, Wi-Fi, SMS, Surf..Mais en espérant qu'Airbus ne perde pas trop de temps à configurer tout cela..
Emirates va placer l'A 380 sur la route vers Honk-Kong. C'est peut-être pour titiller un peu Cathay . En lisant l'article je comprends qu'il y a une escale à Bangkok ? Comme ils le commentaient sur Anet ! La plus sure manière de gagner de l'argent, et de remplir l'avion, pour une Airline ! Ca marche bien mieux que tout autre type de service ou invention Mktg ... on mets l'avion, et ça gagne sa vie, quasi automatique ! Pour le moment du moins vu la rareté du produit. Oui 80 min d'escale pour la liaison en A 380. Certainement pour faire profiter de l'A 380 aux passagers vers la Thaïlande et titiller aussi Thaï au passage. On voit que l'A 380 est un peu le poil à grattter des compagnies qui ne l'ont pas. A défaut d'être la poule aux oeufs d'or pour airbus, ça a l'air d'être une belle machine pour les Cies... avec un bémol pour qantas... à chaque fois qu'on reporte un pépin sur vol qantas (déroutement météo, pb techniques, etc) on s'aperçoit que l'avion n'est pas plein chez eux (c.f. cette semaine l'escale impromptue à Nouméa). Rendre à César ce qui est a Jeannot ! Bien , je ne peux reproduire les liens, mais pas difficile de retrouver le sujet ! Une entrée de EK , chez AA, à 25, peut être 49 % ... improbable mais .... c'est dans le Buzz boursier ! Assez pour faire grimper les actions de AMR corp de 6-7 % ! Ouaf ! Mais sûr que EK (Et les fonds derrière) , ne payeront que si ce n'est pas cher ! speculation of a linkup with the parent of American Airlines. stake in AMR? It wouldn't make sense." in May to combine with Continental Airlines Inc.
Roger Frizzell, an AMR spokesman, declined to comment. owned Belgian carrier that went bust a year later. "You've got to be careful of market speculation but it's flattering that people are talking about us," Clark said. Peut être bien, le fond de la stratégie de EK ! QQ paquets de $$$$ et qq A380, comme teasing ! Et hop, on prend une bonne participation ! J'ajoute, que trouver slots et accords de trafique pour la flotte qu'ils sont en train d'acheter, me paraît des plus diffile, voir improbable ! Ce n'est pas idiot, du tout ! La compagnie de Dubaï, Emirates, a vu son chiffre d'affaires bondir de plus de 58% en France sur les 5 premiers mois de l'exercice sous l'effet d'une hausse des capacités combinée à une forte reprise du trafic affaires, a annoncé mardi à l'AFP son directeur général France.